Children can usually sense, even measure, the passing of time by the way the day falls into place. They will be aware of the subtle changes in their routines – from breakfast, to going to nursery or school; through to lunch and their evening meal; and finally bedtime. As they develop, they will begin to become aware of the changing cycle in their environment that signifies the day passing. They will be able to physically note the days regularly changing as they become lighter, darker, warmer or colder. There is also the very obvious movements of members of the family such as siblings going to and coming back from school, and adults getting ready to go to work and arriving home again. These predictable sequences of events give children a clear picture of the passage of time and can be a starting-point for discussions. 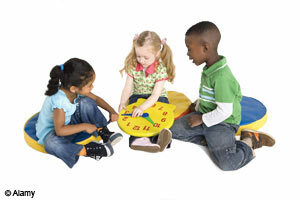 Using resources, such as timers or photographs will support their understanding further. Sand and battery timers; clocks; watches; daily chart showing day, date, month and weather. Development matters: describe and talk about what they see (30-50 months); show an awareness of change (40-60+ months).